Teacher (Semiotics/Univ. of Bologna), editor, cultural commentator, and novelist (Foucault's Pendulum, 1989), Eco offers refreshing commentary on cultural life, primarily in Italy, from the mid-1960s to the late '80s, when intellectuals were especially alarmed by the emergence of a mass or pop culture. Dedicating his book to those he calls the "apocalyptics," cultural elites who fear the destruction of their world by mass communication and popular entertainment, he offers historical surveys of key terms such as "culture," "intellectual," and "design," bringing to these terms more inclusive definitions that embrace comic books, TV, popular music, and a whole range of experience that he includes in the idea of civilization. He recalls introducing his collection of Superman comics at a distinguished European conference of theologians and philosophers discussing mythography; republishes his famous essay from the New York Review of Books on "Peanuts" (the "microcosm," the "primitive epic") for "humanists who do not read comic strips"; and to prove that "the medium is not always the message," he analyzes the official comic strips of the Chinese communist government. 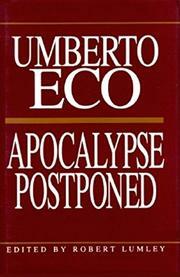 In lucid, persuasive, and artfully illustrated essays, Eco expands the range of what is acceptable as culture: television programs, computers, popular music, posters, the whole counterculture, anything that does not require paper made from trees, for, he concludes in a typically gnomic remark, "every new book reduces the quantity of oxygen." Although Eco occasionally sounds foreign and anachronistic, he displays a universal sympathy and a comprehensive eye that ranges from Snoopy, who has "no hope of promotion," to the "Genius Industry"--those poor eccentrics who believe themselves to be victims of their own originality, publishing and reviewing their own books. Eco is a true original--substantial, lucid, humane, and a great deal of fun.